Win a Trip to London with Masterpiece! 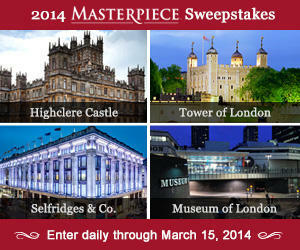 Enter the 2014 MASTERPIECE Sweepstakes daily thru 3/15/14, for a chance to win a trip for 2 adults from the US or Canada to Great Britain! Enter the Sweepstakes--You May Win a Trip to London! Trip includes VIP reception at Highclere Castle (setting of Downton Abbey), private tour of the Museum of London’s forthcoming Sherlock Holmes exhibit, a behind-the-scenes tour of Selfridges & Co. department store, and more! Travel must take place July 30-August 4, 2014. You may also win 1 of 4 monthly prizes—gift certificates to purchase PBS merchandise.